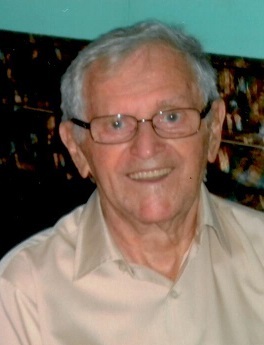 Eugene F. Kish, 93, of 110 East Ninth Street, Oil City, PA., passed away on July 1, 2018 . Born on March 2, 1925 in Oil City, PA., he was the son of the late Stephen & Margaret Hegedus Kish. He attended Oil City Schools and enlisted in the Engineering Corps of the United States Army in 1942, serving in European Pacific theaters until 1945. In November of 1960, he married the former Ruth H. Watson in Good Hope Lutheran Church and she survives. Mr. Kish had worked as a Maintenance supervisor for Pennzoil, retiring in 1986 after 40 years of service. Gene enjoyed hunting, fishing, photography, bowling and golfing in his earlier years. He always kept his home and lawn well maintained and enjoyed cutting his grass. Gene was a life long Steelers and Pirates Fan. He was a member of Good Hope Lutheran Church. Halle Kiehl & her husband Bill and their dog “Gabby” of Erie, PA. Arrangements are being handled by the Reinsel Funeral Home & Crematory.